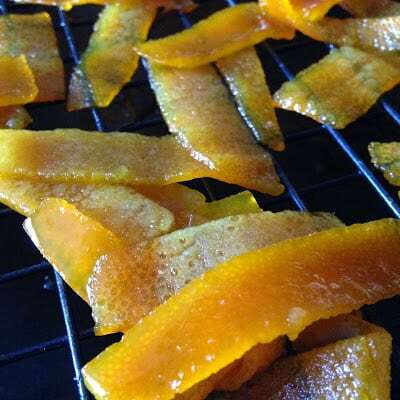 Candied Orange peels can be used in summer drinks, tea, cakes, cookies, muffins, scones. Candied Orange can be used anywhere you would like to add Orange flavor. Dip one end of Candied Orange into melted chocolate for an extra special treat. 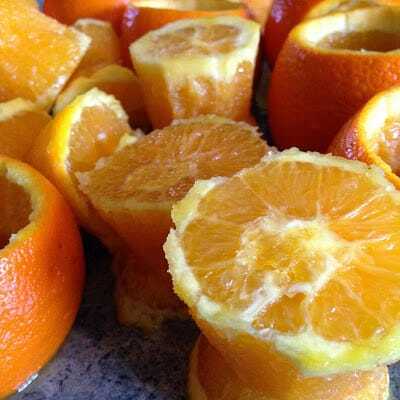 Juice the oranges using a juicer, pour juice into ice cube trays, freeze until firm. Remove frozen juice from ice cube trays. Place cubes in freezer baggies and freeze for another use. Add juice cubes to cocktails, tea and water to add that extra zing of flavor. 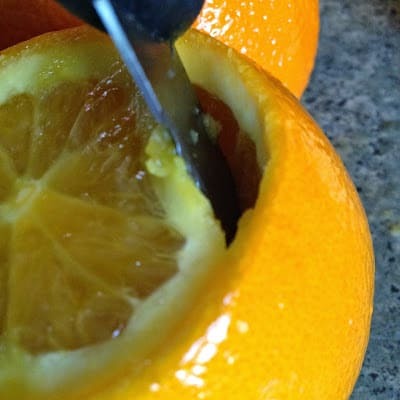 Slice off both ends of the oranges. Insert a very sharp, small knife between the peel and the membrane that hugs the flesh about 1/4-inch deep. 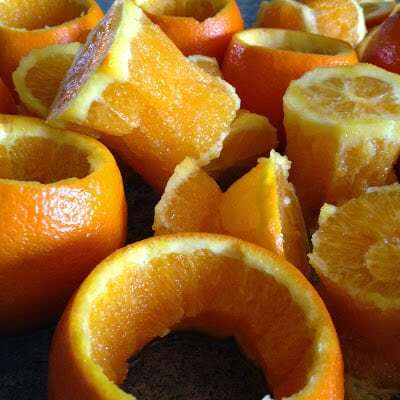 Work the knife all the way around the ends of the orange. Repeat with the rest of the oranges. 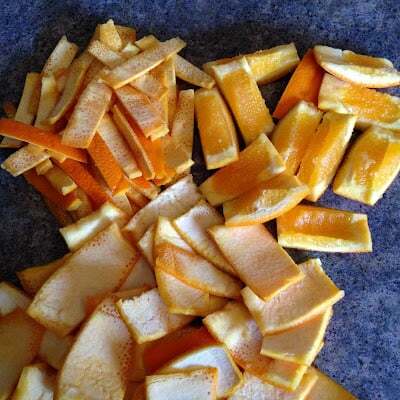 Cut each piece of orange peel lengthwise into 2 to 4 strips. 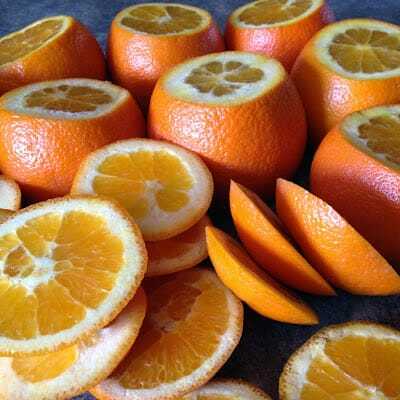 Lay each strip, peel side down on a cutting board. 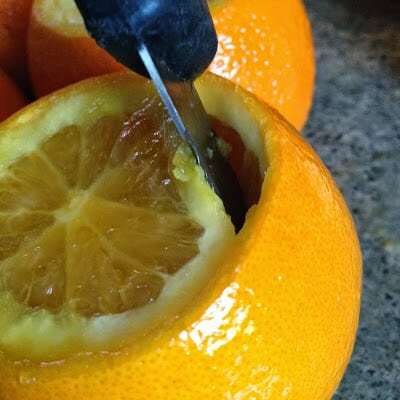 With a very sharp small knife, sliver off as much of the pith as you can, don’t worry about getting it all. In a medium saucepan, bring 4 cups cold water to a simmer. Add the peel to the simmering water in the saucepan, simmer 2 minutes and drain. Repeat this process two more times, using fresh cold water each time. In a medium saucepan, combine 2 cups sugar and 2 cups water. Slowly bring to a simmer, stirring frequently. 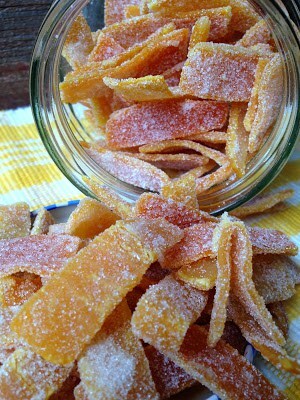 The sugar syrup should be clear before adding the triple blanched orange peels. Simmer gently for about 1 hour and the peel is translucent and tender. To test, lift a piece of peel from the syrup mixture. Let cool slightly then sample. 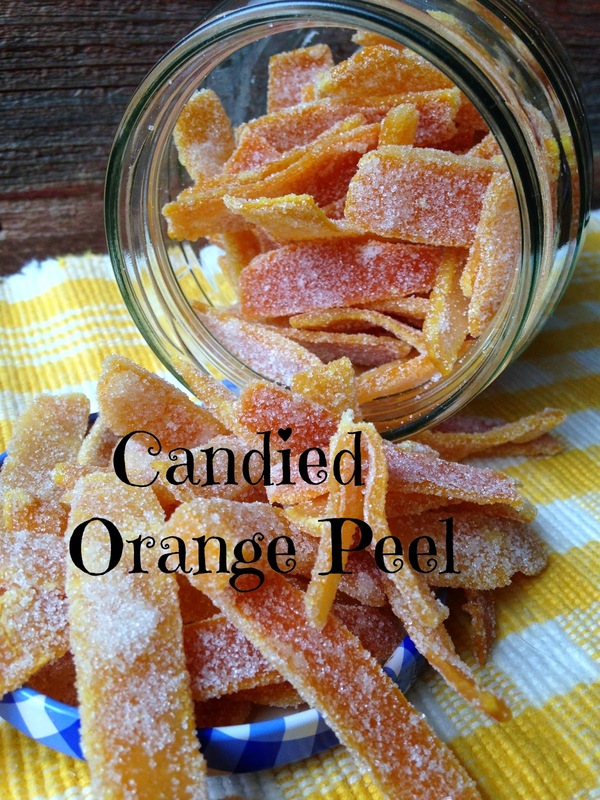 If you can easily bite through the peel, it’s done. If not, simmer until peel is tender and test again after about 15 minutes. When the peel is tender, remove peel from syrup with a fork or tongs. 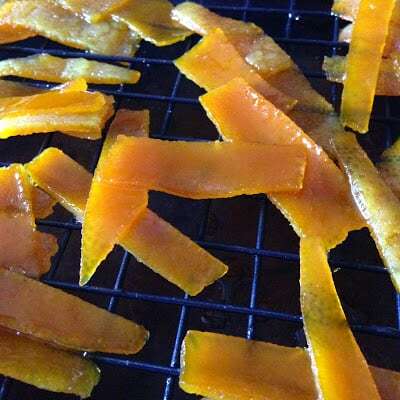 Lay peel on a wire rack set over a sided baking sheet. Let cool completely, then let dry for several hours. 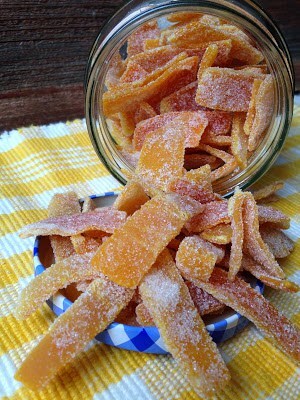 When completely dry, add 2 cups sugar to a small bowl. 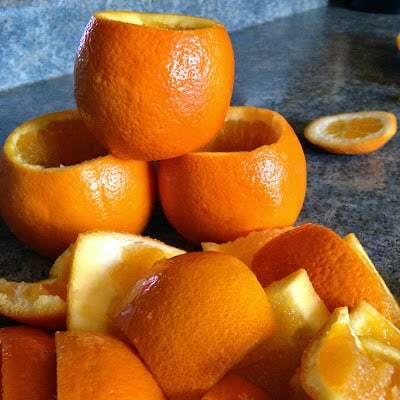 Add a few pieces of orange peel at a time to bowl with sugar, toss the orange peels in sugar to coat. Set on a clean wire rack to completely dry. Store in the refrigerator for several weeks in an airtight container. You really have a very nice website. Pleasant to work with and scores and scores of great recipes.